How do you spell dominance? Flag-to-flag. January 28, 2017 | University of Phoenix Stadium| Glendale, Ariz.
Foothill Ranch, CA (January 29, 2017) – Monster Energy Kawasaki riders Eli Tomac and Josh Grant came into Round 4 of the AMA Monster Energy Supercross, an FIM World Championship looking for the win. It wasn’t long before the No. 3 machine was looking comfortable underneath the dome, qualifying four-tenths of a second off the leader. Tomac would grab the 450 Heat Race 1 holeshot and lead every lap to capture his second heat race victory of the season, while his teammate Grant finished fourth to advance into the Main Event. At the start of the 450 main, Tomac took his second holeshot of the night and quickly began stretching out his lead over the field. At the halfway mark, Tomac had stretched his lead to over 10 seconds on the field and wouldn’t stop there, as his lead reached 18 seconds at one point. Tomac rode his KX™450F flawlessly to his first Monster Energy Supercross victory of the year while teammate Grant took the checkered flag in 12th. 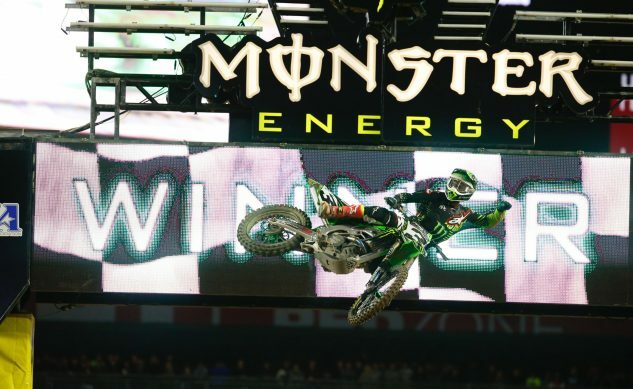 Monster Energy/Pro Circuit/Kawasaki rider Justin Hill looked to carry the momentum from his win at Angel Stadium into Round 4 in Glendale, Arizona. After qualifying on pole, Hill went on to win his heat and teammate Austin Forkner backed him up with a second place finish. When the gate dropped on the 250 Main Event, rookie Forkner grabbed the holeshot aboard his KX™250F with Hill rounding Turn 1 in fourth. Forkner held the lead for five minutes before slipping back into third. Hill began clicking off the laps, slowly inching up on the leader until he was within striking distance. With two laps remaining, Hill blitzed the whoop section and pushed the leader wide to take over the position. He would go on to win his second consecutive Main Event of the season and a historic 250th supercross/motocross win for Monster Energy/Pro Circuit/Kawasaki. 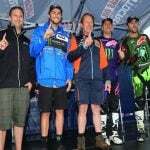 Forkner held on to get his first professional Monster Energy Supercross podium with a third place.